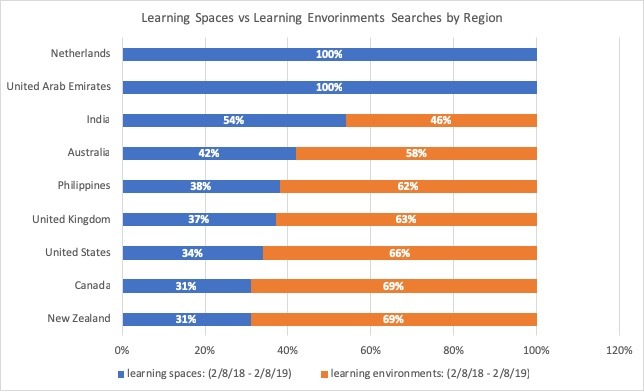 Surprisingly, there are global differences in the popularity of the search terms “learning spaces” vs “learning environments. Take a look at this graph over the past 12 months, which is ‘live’ and will keep updating so check back for updates! At the time of this original post, Feb 8th, learning environments was a more popular term worldwide, see the graph above. Now, exploring Google Trends data on searches between Feb 2018-2019 by region, you’ll notice in the graph below that in the Netherlands and UAE, 100% of searches were for ” spaces” and none for “environments.” Is that possible? And in India, “spaces” was more popular, but by a narrow margin. However, in every other country or region, learning environments was a more popular search. Do you think this Google Trends data is accurate? Why do you think there is this difference in popularity? What does this mean for how we write about, talk about, search on, or hashtag the topic?